The definition of just what blues is can be surprisingly elastic.They can just as easily be a punctuated by celebratory whoops as mournful cries, and can be thoroughly ‘legitimate’ coming from a hard-driving big band, with raucous beats designed specifically for dancing. 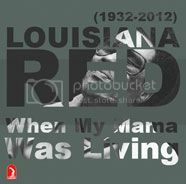 But few would argue that When My Mama Was Living, a posthumous release from Louisiana Red (he passed in 2012, as noted in the collection’s subtitle) is about as real as the blues gets. 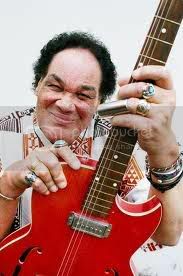 Recorded primarily over two sessions in the mid-seventies, Red (real name Iverson Minter) is joined on a handful by Peg Leg Sam on harp and vocals, with Lefty Dizz contributing guitar to a pair.For the most part, though, it’s just Red, his harmonica, and guitar.It’s deceptively simple stuff, nothing fancy or ornate either instrumentally or vocally – a couple of tunes are just Red’s vocals and harp – but it’s supremely expressive and utterly riveting. Red’s blues aren’t the party-hearty grooves designed for good times and dancing; this is almost unrelentingly stark stuff, the cry of a truly tortured soul.Given his background it’s hardly surprising that the bulk of Red’s music dwells in dark places indeed - his mother died shortly after giving birth, and his father was hanged five years later, quite possibly by the Ku Klux Klan. That’s not to say there aren’t joyful moments to be found. Peg Leg Sam brings an almost impish mischievousness to his own “I’ll Be Glad When You Are Dead You Rascal You,” and Slim Harpo’s “King Bee,” has all the requisite menace and swagger.And there’s a fine, driving version of traditional “John Henry,” though there, too, the story isn’t exactly a happy tale. Elsewhere, though, most of the tunes were written by Red and/or producer Kent Cooper, the man who ‘rediscovered’ Red (he was working in a barrel factory) and coaxed him into a second career in music.They’re basic, hard-core twelve-bars, stark and brooding, haunting and chilling, with titles like “Cold White Sheet” and “Caught Your Man And Gone” and “Cold, Cold Feeling,” while the title track, a solo-voice-and-guitar, is a bitter and harrowing lament of hurt and loss.The disc closes with “Joanna,” the only track to feature a band (unknown,) recorded during a live radio broadcast, but they’re strictly there for support and never overpower Red’s pinpoint acoustic picking and impassioned vocal. It’s not for the faint of heart, nor is this is not the kind of stuff to liven up a party or brighten your day.Utterly without pretense or polish, it’s intense and emotionally raw and absolutely, unquestionably true – often frighteningly so. And on that basis, it’s absolutely magnificent.